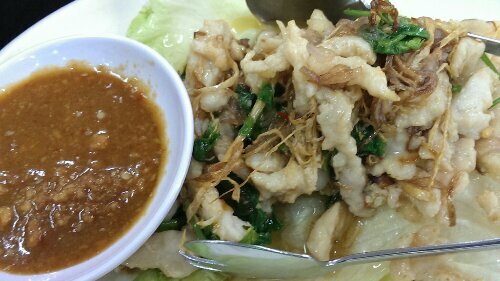 No Signboard Seafood 無招牌海鮮 @Geylang Road (Singapore) | Get Your Grub On! One of my good old Singapore friends had the extremely annoying idea to leave and move to Hong Kong so to give her a small send off, a group of friends including me took her out for some good old Singapore style seafood at her favorite place , the coffeeshop branch of ‘No Signboard Seafood’ in Geylang. The main reason to come here of course were the crabs. 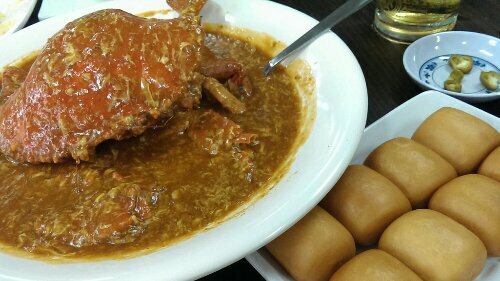 The ‘Chili Crab‘ looked delicious and had a great punch of heat to it but as weird as it sounds was a bit too crabby on the gravy for me and I also wished for it to have been fruitier but then I am not the biggest fan of this version of crab anyway. 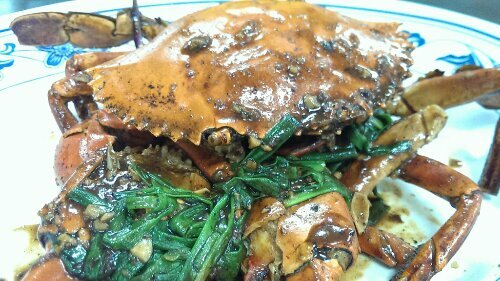 This was the bugger I was waiting for, their ‘Black Pepper Crab‘ my favorite crustacean by a long shot. The gravy was thick and so loaded with crushed pepper that I claimed the major share for myself and simply started eating directly from the serving plate. The crab was sweet and fresh and easily peeled out the shell. Only problem was we only ordered one. One dish I usually get as well is the ‘Stir Fry Crocodile‘ that did get mixed ratings from my friends especially because if it’s texture some said was chewy. I disagreed as I found this to be just nice and firm with a tendency to slight bounciness. The meat itself had not a very particular taste of its own but together with the super thin fried ginger strips, the other spices and especially the chilis it became very fragrant and subliminal spicy. Something different than your standard seafood. I always liked this place, it was where I had these famous Singaporean crabs for the first time five over years ago and I appreciate the much more relaxed atmosphere compared to the other way fancier locations within a vibrant bustling neighborhood.